When a writer meets and marries an editor, the result is books. Ian and Gayle Moore-Morrans have just published their first book written together, a children’s book called Jake, Little Jimmy & Big Louie. Their previous books, written by Ian and edited by Gayle, are From Poverty to Poverty: A Scotsman Encounters Canada, a memoir, and Beyond the Phantom Battle: Mystery at Loch Ashie[, a novel]. The couple included members of their extended family, great-grandchildren Leland German, then 11, as reader, and Hannah German, then [seven], as illustrator. Jake, Jimmy & Big Louie is a book to appeal to anyone of any age who has ever loved and raised a pet. Ian draws on his own experiences raising a cockatiel to tell the story of a boy who takes on a budgie with a disability and an at-first unwanted raven, and follows their adventures and growing friendship. Ian, 82, still has vivid memories of the first time he ever saw a book. He grew up in poverty on the West Coast of Scotland. He later became a blacksmith, then an industrial machinist and has written a book, Metal Machining Made Easy. Gayle also showed an early aptitude for writing and wrote for church papers and magazines while she was a parish worker, [secretary, social services director and program and magazine editor]. She married a pastor and lived in Germany for [eighteen] years, keeping up her writing and editing and detailed scrapbooks. She was widowed [after she moved to Canada] and met Ian, who had lost his wife, in 2003 in Winnipeg. They made their way west and decided they liked Vernon after performing here as Mr. Scotland and his Bonnie Lassie, a singing duet, at a Kelvern Celtic Society Ceilidh. Ian and Gayle are now working on a new book, Came to Canada, Eh? Continuing a Scottish Immigrants Story. Jake, Little Jimmy & Big Louie is available through http://www.createspace.com/5114278 or Amazon. Their blog is at http://www.ianmooremorrans.com and their publishing company is Moomor Publishing. 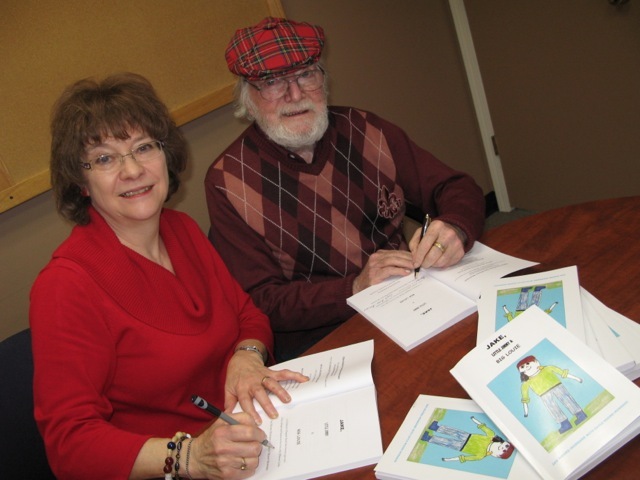 Ian and Gayle will have a book signing Feb. 28 at 2 p.m. at Teach and Learn in Vernon. Saturday, February 28 at 2 p.m. This entry was posted in author interview, Book Review, Children's chapter book, Co-authoring, Inspirational story, Life, Publishing a Book, Reblogging, Writing, Writing muses and tagged aptitude for writing, becoming a writer, birds, boy wanting a pet, British Columbia, budgie, children, cockatiel, Editing, family, Gayle Moore-Morrans, how a book can add value to a reader's life, Ian Moore-Morrans, independently published authors, involving children in producing your book, Jake, journalism, Little Jimmy & Big Louie, newspaper article, raised in poverty, raising birds, raven, Scottishness, Vernon. Bookmark the permalink.